The final proposal to redraw electoral boundaries in Northern Ireland has been published. 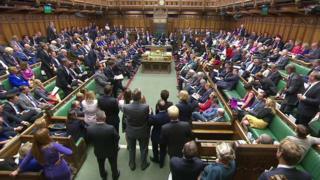 It will cut the number of constituencies from 18 to 17, as part of a wider move to reduce MPs at Westminster from 650 to 600. The plan published today is largely in line with revised proposals published earlier this year which will see Belfast retain four constituencies. West Tyrone constituency will be renamed Sperrin. When the revised proposals were first published in January they were heavily criticised by Sinn Féin. Dungiven will no longer be split between three constituencies, instead it will be moved to Sperrin. Lagan Valley and Strangford will also disappear from the constituency map. The new plan will see the creation of the Causeway constituency on the north coast, merging part of East Londonderry with part of North Antrim and a small section of East Antrim. The remainder of North Antrim is renamed Mid Antrim and takes in parts of East Antrim and South Antrim. South Antrim, in turn, takes part of a defunct Lagan Valley. Another portion of Lagan Valley merges with a section of Strangford, and a small part of South Down, to become Mid Down. South Belfast is also expanded to take in parts of Lagan Valley and Strangford. The plan will now go before Westminster for approval and there is no guarantee it will get the votes needed to pass both the House of Commons and House of Lords. "The Boundary Commission has determined its final recommendations after careful consideration of all the evidence collected during three stages of open and transparent public consultation. "The commission is grateful to all those who took the time and trouble to respond. "We have sought, where possible, to try and accommodate the wide range of views and proposals presented whilst remaining within the constraint of the statutory criteria imposed upon the 2018 Review."